Nineteen-year-old Greg Sestero met Tommy Wiseau at an acting school in San Francisco. Wiseau's scenes were rivetingly wrong, yet Sestero, hypnotized by such uninhibited acting, thought, 'I have to do a scene with this guy.' That impulse changed both of their lives. Wiseau seemed never to have read the rule book on interpersonal relationships (or the instructions on a bottle of black hair dye), yet he generously offered to put the aspiring actor up in his LA apartment. Sestero's nascent acting career first sizzled, then fizzled, resulting in Wiseau's last-second offer to Sestero of co-starring with him in The Room, a movie Wiseau wrote and planned to finance, produce, and direct-in the parking lot of a Hollywood equipment-rental shop. Wiseau spent $6 million of his own money on his film, but despite the efforts of the disbelieving (and frequently fired) crew and embarrassed (and frequently fired) actors, the movie made no sense. Nevertheless, Wiseau rented a Hollywood billboard featuring his alarming headshot and staged a red carpet premiere. The Room made $1,800 at the box office and closed after two weeks. One reviewer said that watching The Room was like 'getting stabbed in the head'. 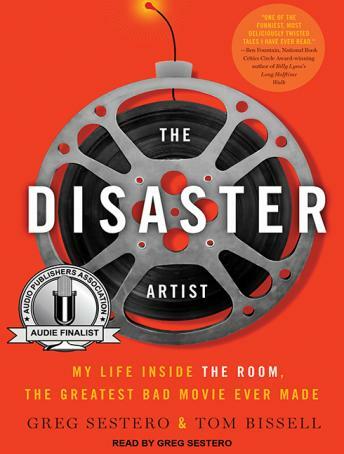 The Disaster Artist is Greg Sestero's laugh-out-loud funny account of how Tommy Wiseau defied every law of artistry, business, and friendship to make 'the Citizen Kane of bad movies' (Entertainment Weekly), which is now an international phenomenon, with Wiseau himself beloved as an oddball celebrity. Written with award-winning journalist Tom Bissell, The Disaster Artist is an inspiring tour de force that reads like a page-turning novel, an open-hearted portrait of an enigmatic man who will improbably capture your heart. Sounds great. Love the book. Interesting insight into The Room. Greg's narration is perfect. Spot on TW impression makes for a fun listen. Absolutely brilliant all around. Love it. A truly wonderful story from beginning to end. I had never heard of The Room before listening to this book and was initially drawn in by the bizarre, unusual concept of being part of something so horrendously awful. Much to my surprise, the story wound up being about far more than that; it was about friendship, love, empathy, manipulation, and ultimately, the pursuit of a dream. In addition, Sestero did such an incredible job doing the voice of Tommy that I often felt like I was listening to two separate individuals with very distinct personality traits; Greg (himself) being empathetic and genuine, and Tommy being bold and blindly ambitious. If you've never seen The Room and are considering listening to this book - I strongly advise that you wait to watch until after you've finished this. Knowing the back story of each character, as well as the chaos that went on behind the scenes, made it so much more painfully wonderful. Highly recommended!